We’d love your help. Let us know what’s wrong with this preview of The Descent of the Child by Elaine Morgan. Why are chimp babies skinny, while human babies are so fat they float? As humans developed greater intelligence--and increased cranial capacity--how did babies and mothers adapt to increased fetal brain size? And how did humans develop our unique intelligence. Elaine Morgan, an internationally bestselling science writer known for her iconoclastic take on evolutionary theor Why are chimp babies skinny, while human babies are so fat they float? As humans developed greater intelligence--and increased cranial capacity--how did babies and mothers adapt to increased fetal brain size? And how did humans develop our unique intelligence. 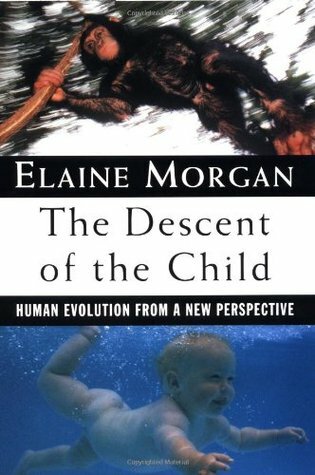 Elaine Morgan, an internationally bestselling science writer known for her iconoclastic take on evolutionary theory, addresses these questions and more in The Descent of the Child, an intriguing and controversial look at human evolution from the point of view of infant development. Beginning with the assertion that much of our thinking about human evolution exercises an unconscious bias--that we envision an archetypal human being as an adult--Morgan sets out to explain why human infants evolved in the way they did. We are often told how, in the course of a million years, adults acquired increased dexterity, adaptability, intelligence, and powers of communication. We are seldom reminded that over the same period infants became more helpless, more vulnerable, and more inert. Morgan focuses on the relationship between these two facts as she develops a stunning theory of the origins of human intelligence she argues that our capacity for intelligence is a byproduct of evolving babyhood. Uniquely among primates, homo sapiens are born with considerable struggle, emerge wholly helpless, and continue to be dependent for a long time afterwards--only their eyes, faces, and vocal cords work. They don't know that they're not always going to be like that, Morgan posits, but, bent on survival, they try to manipulate their parents or other caregivers to do things that the babies can't do for themselves. (For instance, they'll cry for food, and only human babies continue crying after being picked up, sending a strong message not to be so remiss next time.) These early struggles, according to Morgan, provide our formative intellectual activity. It is in infancy that we really learn to think and to question. To ask other readers questions about The Descent of the Child, please sign up. This book has some interesting ideas, but it is almost pure speculation with no supporting research of either the library or experimental kind. It is chock full of hypotheses without enough evidence to elevate them to the level of theories. I read this years and years ago and have given it away several times and find myself recommending it more than most any other book. Everybody, but especially every parent should read this book. Lots of great insights about humanity, parenting, and especially the genius of your child. I just finished this and it is quite short (always encouraging). Ms Morgan and I go back a long way. I read 'The Descent of Woman' in the '70s. She's an excellent writer and she seems to effortlessly explain quite complex stuff, including tossing in references if you want to go verify what she says. This makes her highly readable. Then there is what she says. This is about why human children are the way they are. She's arguing against the generally accepted notion that pretty much everything we s I just finished this and it is quite short (always encouraging). Ms Morgan and I go back a long way. I read 'The Descent of Woman' in the '70s. She's an excellent writer and she seems to effortlessly explain quite complex stuff, including tossing in references if you want to go verify what she says. This makes her highly readable. Then there is what she says. This is about why human children are the way they are. She's arguing against the generally accepted notion that pretty much everything we see in a child is something it will need to turn into an adult. 'An adult is just a child's way of producing another child'. Huh? Well think about it. The child state has evolved to do its own thing. It is not just an immature adult. She did a similar thing in 'The Descent of Woman'. Everyone was busily explaining that we (men) are the way we are because of hunting on the savannah. Morgan then asked: why are woman like this then? And proceeded to explain much with the idea that we spent a lot of time in the water, not on the savannah. Re-reading actually. I love to delve into Elaine Morgan's early mankind world. The explanations are understandable and intriguing. In the chapter interacting I saw first hand the behaviors Ms. Morgan was using in her theory. Were the parenting chapter I would say is from a time of Grandparental vision, believing men to believe babies is a thing women have and their care a woman's responsibility. Not saying that there aren't a few men today that epitomise the old version of father, but my experie Re-reading actually. I love to delve into Elaine Morgan's early mankind world. The explanations are understandable and intriguing. In the chapter interacting I saw first hand the behaviors Ms. Morgan was using in her theory. Were the parenting chapter I would say is from a time of Grandparental vision, believing men to believe babies is a thing women have and their care a woman's responsibility. Not saying that there aren't a few men today that epitomise the old version of father, but my experience has lead me to see a new version that is happily willing to care for their infant children. Welsh feminist and proponent of the aquatic ape evolution theory, which claims that mankind evolved from sea-based apes. Morgan was appointed Officer of the Order of the British Empire (OBE) in the 2009 Birthday Honours for services to literature and to education.